The Malaysian Bar calls on the authorities, including the police, to continue to facilitate peaceful public assemblies, such as the one that civil society groups reportedly plan to hold at Dataran Merdeka on 31 December 2013 to protest price hikes in the country. It is the constitutional right of any Malaysian to assemble peacefully in public, whether in celebration or in protest. This would be a legitimate expression by Malaysians of their concerns or objections, and an exercise of their constitutional right. The existence of other avenues of raising their objections, such as organising petitions, writing letters of complaint or speaking to elected representatives, would not exclude or displace the right to peaceful and orderly public assembly. These rights are cumulative and indivisible: they have equal status, and none of them operates to negate or exclude the exercise of the other. The Malaysian Bar urges the police to respect, promote and protect the exercise of the fundamental freedoms of assembly and expression during such gatherings, and not try to stymie or prevent the assemblies. The provisions of the Peaceful Assembly Act 2012 must be read and applied purposively to achieve this, and not applied narrowly, slavishly or technically to frustrate its purpose, as well as the purpose of Article 10 of the Federal Constitution. The police have in effect had more than 10 days’ notice of the planned event. The fact that the police have been speaking about the gathering is itself evidence of their knowledge. The police must not be pedantic in looking at the Peaceful Assembly Act 2012. The notice period of 10 days in the Act is not intended to prevent an assembly, but to allow time for the police to make arrangements to facilitate an orderly and safe assembly. The police should therefore have been spending the time engaging with the organisers on this basis, instead of thumping their chests and rattling their sabres. On various occasions in the past, the police have demonstrated that they can work with organisers of public assemblies to allow participants to walk or assemble, and openly and outwardly express their viewpoints, in safety. We commend these positive and salutary examples. It is thus evident that, with proper liaising and cooperation, it is possible for the police and the organisers to work together to ensure that these events proceed smoothly and peacefully. The Malaysian Bar reiterates that we support and defend the principle of any individual or group’s fundamental freedom to speak, assemble or walk in order to publicly and openly promote and publicise a cause, if that freedom is exercised responsibly and peacefully. We call on the police and Government to always protect and promote the freedoms of assembly and expression in a fair and equitable manner. We also remind organisers of public assemblies of their responsibility to take all reasonable action to ensure a peaceful assembly. My family and I cordially invite our friends and supporters to join us in our Christmas and New Year celebration on Sunday 5 January 2014. KUCHING: The Federal Court's decisions in the cases of Madeli bin Salleh (2007) and Bisi Jinggot (2012) gave Sarawak natives the "weapon" they needed to fight encroachment into their native customary rights (NCR) land. The rulings recognised native titles to indigenous lands, territories and resources and confirmed that customary land rights are based on native law and customs and that the customs of the various communities define the content of the customary title and may be proved under common law. These decisions also opened the possibility of legal action against the Sarawak government when the Federal Court rejected the application of the state government to review the decision. In dismissing the said application by the Sarawak government, the Federal Court held that the earlier panel had not committed any error of law or fact which requires or justifies a review. Among others, the Federal Court accepted the law on NCR land as stated by Justice Ian Chin in the High Court in the Nor Anak Nyawai case decided in 2001 in which he held inter alia that NCR land included both cultivated or cleared land and communal forests within the communal land boundary of a longhouse. Baru Bian said: "At the High Court, they studied history, customs and terminologies used and decided that for NCR land there were three areas, temuda or farmed and felled settled areas; pulau galau or the reserve virgin forests within a vicinity of the village and; pemakai menoa or the communal territory or territorial domain covering the hunting and fishing grounds and virgin forests surrounding a village. This is where expert witness Nicholas Bawin Anggat's role paved the way to determine the Dayak's way of life and establish the definition of the native adat (customs). Bawin, who is a social activist and state PKR leader, has appeared in court almost 100 times for NCR court cases, including numerous landmark cases. He said: "My first appearance in giving testimony which turned into a landmark case was in 1999 in the Nor Nyawai case, when I was deputy president of Majlis Adat Istiadat. Since then, I have appeared in almost 100 cases and the NCR landowners have won almost all the cases." He was subsequently served a letter of termination from his post apparently for his role in interpreting the traditions and customs of the natives which eventually led to the courts' ruling in favour of the NCR landowners. Bawin, an Iban originally from Batang Ai whose family was resettled in Engkari in Lubok Antu, said: "As an expert witness, I testify on the adat law and customs of the Iban community and the Iban way of life. From the natives' point of view, they believe their rights exist by the practice of their customs and traditions." Baru revealed: "We have succeeded in arguing in the courts that NCR land is a source of life to the natives. Land means life -- it is their nyawa, a bloodline; thus taking away land is taking away life. The state government cannot extinguish NCR land the same way it can extinguish ownership of ordinary land. It has to be dealt with differently. "In two cases, NCR land has been equated to life and protected under Article 5 of the Federal Constitution which states that every person has the right to life." This is the third and final part of a series on NCR land. KUCHING: It is amazing what awareness can do in the fight against injustice. For Sarawak natives, their fight for justice against people who robbed them of their ancestral lands has taken on a different note – thanks to some activists. The general consensus is that the number of Native Customary Rights (NCR) cases in Sarawak has increased. "More people are coming to see me from far and wide in the state, and I think it is because people are more aware of their rights, that they can take their rights to court, and they can defend themselves by taking the government and companies to court,” said NCR land lawyer Baru Bian, who is Sarawak PKR chief and Ba'kelalan assemblyman. Baru, 55, said publicity on their victories in NCR cases had also contributed to this, adding that they were getting cases from as far as Kapit, Ulu Baram, Limbang and Miri. “NCR landowners are now more empowered to stand up for their rights, especially with the support of NGOs in the state." Observers pointed out that the increasing number of cases could have resulted from the government's aggressive emphasis on oil palm plantations by handing out provisional leases (valid for 60 years) in virgin forest areas. Previously, it was timber licences, which had a tenure of 10 years. As these companies expand and move into the interiors, more land is affected, resulting in conflicts. According to Baru, as long as the state government refused to accept the decisions made by the Federal Court in numerous cases, the NCR land issue would continue to flare up. "In his winding-up speech at the recently-concluded State Legislative Assembly (DUN) sitting, Special Functions Minister Tan Sri Adenan Satem made it clear that the state government only considered temuda as NCR land notwithstanding 10 cases won in the High Court, five Court of Appeal and two Federal Court cases. "I can safely state that the state government's view is wrong in law. Firstly, our submissions in all cases are based on Section 2 of the State Land Code on the definition of NCR land, and secondly, the courts agreed that NCR land in Sarawak is not only protected by the State Land Code or by the statute but also by common law principle," said Baru. Baru explained that the significance of the decision was that licences for logging and planted forests and leases for oil palm plantations issued by the state which overlapped with the land within the communal land boundary of the longhouses did not or, could not, extinguish the prior customary rights of the natives. According to Baru, his firm had won 10 cases in the High Court that confirmed, affirmed and followed Nor Anak Nyawai on the concept of temuda, pulau galau and pemakai menoa. "If you read the two cases, you have covered everything already, Madeli bin Salleh reflected Nor Nyawai which followed Adong Bin Kuwau, an 'Orang Asli' case from Johor which involved the acquiring of land for constructing a reservoir to supply water to Singapore. "When Madeli's case went before the High Court, it did not win; so an appeal was lodged. By then, Nor Nyawai's case won at the High Court, so Madeli's case adopted Nor Nyawai's case and it won at the Court of Appeals and the Federal Court upheld the decision," he added. Observers monitoring the scenario and legal implications are convinced that it is just a matter of time before the parties that had lost their cases in court to NCR landowners would contemplate taking legal action against the state authorities responsible for the fracas. Said one observer: "I see the vulnerability of the office bearers; there were rumours some time ago that certain parties that had lost out on land due to the NCR issue were contemplating their next move in looking for redress for their predicament. "It's not impossible since we are looking at very heavy investments to the tune of millions, they can sue for misinformation and misleading." Baru agreed: "Legally speaking, the state government could be sued for the cases that the courts have ruled in favour of the NCR landowners by the investors such as the oil palm companies for being negligent in allotting an area that is encumbered by NCR land issues. The state government will feel more pressure as a lot of things are at stake." Tomorrow, the third and final part of this series will look into the landmark cases. KUCHING: Timber and plantation companies that had secured timber licences and provisional leases (PL) in Sarawak are now worried about their investments because of landmark cases in the Federal Court that affirmed the Native Customary Rights (NCR) over native land. It is learnt that some investors met recently with non-governmental organisations (NGOs) in the state as part of their fact-finding mission to clarify their positions as most of their projects involve NCR land that required investments running into millions of ringgit. They are concerned that they could lose their money if their projects fail to take off because of the court cases that have favoured the natives. All this time, they had thought they had the upper hand when it came to the law. Sources say that prior to two landmark decisions meted out by the Federal Court, the final appellate court in the country, the investors had based their understanding of customary land rights on information provided by legal sources representing the state, including former state Attorney-General Datuk J C Fong. Fong's book entitled The Law on Native Customary Land in Sarawak, which was released in March 2011, stated that the acquisition of rights to land is by custom or practice recognised by law, such as clearing virgin jungle, planting and occupying the land continuously. Detractors pointed out that he continued to insist that this custom and practice was confined to temuda or farmed land and felled settled areas only. They stated that both the former AG and the state continued to maintain that they only recognised customs and practice under the laws of Sarawak. However, the Federal Court affirmed in two landmark cases that NCR lands extended to an area wider than the temuda, to encompass the pulau galau reserve virgin forest within the vicinity of the village and pemakai menoa communal territory covering hunting, fishing grounds, former longhouse site and virgin forests surrounding the village. However, sources said the state repeatedly showed its "contempt" of the court ruling by continuing to issue PLs and timber licences for such lands, and appealing judgments made by the lower courts which favoured native landowners. The Federal Court's affirmation in two landmark cases - namely, Madeli bin Salleh and Bisi Jinggot - set a huge precedent and the tone for all other future cases that will be handled by the courts. This is giving investors the jitters when dealing with projects involving land in the state and therefore raises a huge impediment in any case that involves NCR land. Says NCR land lawyer Baru Bian, who is Sarawak PKR chief and Ba'kelalan assemblyman: "JC Fong maintains that the government has 'recognised and protected indigenous people's rights over land created by their recognised customs and practices'. What he failed to say is that the current government refuses to abide by the ruling of the highest court in this country relating to the definition of NCR. Baru Bian and Associates is the leading law firm in the state dealing with NCR cases and handles around 70% of the existing cases. There are only a handful of lawyers in the state who handle NCR land cases mainly because these cases are difficult and bring in little money since the charges are determined according to the plaintiffs' capabilities. "We have records of more than 200 cases including cases that have been settled, withdrawn and decisions taken. At the moment, we have another 100 cases active in court; so to say there are a total of 400 cases throughout Sarawak also handled by other lawyers would be accurate. "I embarked in this area of law out of necessity in late 1980s when my family land in Long Semadoh in the Lawas district was encroached upon by one of the state's plantation companies. I took it to court but then settled out of court," Baru said. This is the first of a three-part series on NCR land. The second part will appear tomorrow. This year in my Christmas reflection, I am drawn to thinking about the family that Jesus was born into, comprising his mother Mary, and his father Joseph of the House of David. Joseph, who is perhaps more accurately described as Jesus’ foster-father, does not receive much mention in the Bible and no words of his are recorded in the only two Gospels where he is mentioned. Because of the low profile of Joseph in the Bible, nothing much is known about him, save that he was a carpenter who was betrothed to Mary, and that he was called upon to give his protection and love to the virgin Mary and her child. The discovery about Mary’s pregnancy, which is recorded in both the Bible and the Qu’ran, must have been a huge shock to both Mary and Joseph. How would any man react upon finding out that his betrothed was pregnant when he had not touched her at all? From what little that is written about Joseph, we see that he was a man of admirable character. He was a just yet compassionate man; despite the shame, the hurt, and the anger that he must have experienced when he suspected that Mary had been untrue to him, he planned to break off the engagement quietly rather than expose her to public humiliation (she would most likely have been stoned), according to the Gospel of Matthew. He was a man of quiet conviction and integrity; when he received the message that he was to protect Mary, he took on the task and never wavered from the course. This course, as we know would prove to be difficult and dangerous at times, from the humiliation of a stable delivery for his wife, to the perilous escape to Egypt. He was a responsible husband and father, who discharged his duties to his family with patience, courage, wisdom and strength. He was the male role model in whose care Jesus grew in wisdom and stature (Luke 2:52), and from whom Jesus learnt his trade. Joseph may have been silent, but he played a pivotal and crucial role in God’s plan. More than two thousand years on, we have much to learn from the example set by this quiet man of solid character. He was a man who just got on and did what he believed was right. In today’s world rife with corruption and crime, we need to remind ourselves that there are still people who believe in quietly doing what is right. Many people of this day belong to the ‘instant gratification’ generation who do not appreciate the value of working and waiting for what they want, and who place their own needs above everyone else’s. We need to allow the simple values back into our lives in order to live more meaningfully. As for staying on the course, how many of us and our leaders remain faithful to our causes, no matter the public ridicule we may have to endure? In this day and age, principles take a backseat for many in their quest for riches and fame. Some political leaders jump from one party to another for personal gain faster than a frog in a boiling pot and many indulge in underhanded practices to ensure victory. Thankfully, however, there are still many for whom principles and the desire to do what is right set their course in life and dictate their actions. These are the members of political parties, social activists, civil society, NGOs and also individuals who continue to speak up for the rights of the downtrodden, the marginalized and the victimized, even when intimidated and threatened with arrests. Obstacles may be thrown in our paths, and the road may seem daunting and long, but we must persevere in doing what is right, with firm conviction in our cause. It would be remiss of me not to acknowledge that there are many, who like Joseph, are the silent but strong support systems without whose backing and strength the frontline fighters could not function effectively. Some are present as our friends, others offer advice and ideas, some contribute financially to our projects, and yet others fortify us with encouragement and prayers. Members of our families are the pillars of strength who share our burdens as well as our joys. How thankful we are for all these buttresses in our lives who shore us up and sustain us each day. My friends tell me that Catholics regard Joseph as the patron saint of social justice, amongst other things. How apt it is, for those of us who are engaged in the struggle for social justice and fairness to take inspiration from this man who kept the faith and who carried out his duties with infinite patience and conviction. Let us all remain steadfast to our beliefs and stay on the course. I wish my Christian friends a blessed Christmas, and to all, a Happy New Year. 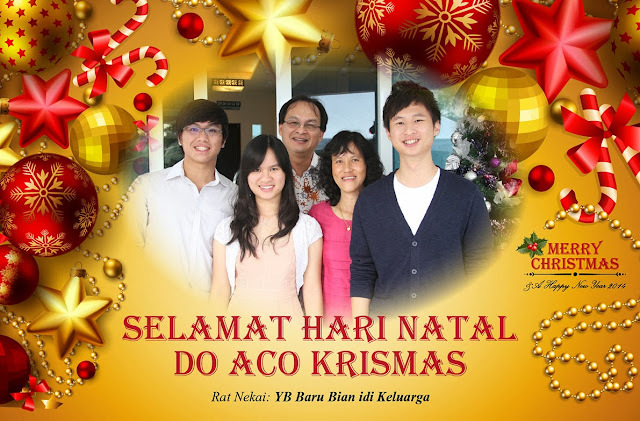 Dalam refleksi Krismas saya pada tahun ini, saya tertarik untuk memikirkan keluarga kelahiran Yesus, yang terdiri daripada ibunya Maria, dan bapanya Yusuf daripada keluarga Daud. Yusuf, atau lebih tepat digambarkan sebagai bapa angkat Yesus, tidak banyak disebut di dalam Alkitab malah dalam kedua-dua Injil yang bercerita tentang Yusuf iaitu Mattius dan Lukas, tiada kata-kata Yusuf yang telah direkodkan. Oleh kerana profil rendah Yusuf di dalam Alkitab, tidak banyak yang diketahui tentang beliau, kecuali bahawa beliau adalah seorang tukang kayu yang telah bertunang dengan Maria, dan telah dipanggil untuk memberi perlindungan dan kasih sayang kepada Maria dan anaknya. Penemuan tentang kehamilan Maria, seperti yang dicatatkan di dalam kedua-dua Alkitab dan al-Quran, tentunya merupakan satu kejutan besar kepada kedua-dua Maria dan Yusuf. Ia (malaikat) berkata: "Sesungguhnya aku pesuruh Tuhanmu, untuk menyebabkanmu dikurniakan seorang anak yang suci". Maryam bertanya (dengan cemas): Bagaimanakah aku akan beroleh seorang anak lelaki, padahal aku tidak pernah disentuh oleh seorang lelaki pun, dan aku pula bukan perempuan jahat?" Ia menjawab: "Demikianlah keadaannya tak usahlah dihairankan; Tuhanmu berfirman: Hal itu mudah bagiKu; dan Kami hendak menjadikan pemberian anak itu sebagai satu tanda (yang membuktikan kekuasaan Kami) untuk umat manusia dan sebagai satu rahmat dari Kami; dan hal itu adalah satu perkara yang telah ditetapkan berlakunya. Bagaimanakah seseorang lelaki akan bertindak apabila mendapati bahawa tunang beliau telah mengandung apabila beliau tidak pernah menyentuhnya? Daripada perkara yang dituliskan tentang Yusuf, kita dapat melihat bahawa beliau adalah seorang yang mempunyai sifat terpuji. Beliau adalah seseorang yang mempunyai belas kasihan; walaupun Beliau terpaksa mengalami perasaan malu, sakit, dan kemarahan apabila beliau mengesyaki bahawa Maria berkemungkinan tidak setia kepadanya, beliau telah merancang untuk memutuskan pertunangan mereka secara senyap dan tidak mendedahkan Maria kepada penghinaan awam (Maria berkemungkinan akan dilempar batu), mengikut Injil Matius. Beliau adalah seorang yang tenang; apabila menerima mesej bahawa beliau telah ditugaskan untuk melindungi Maria, beliau telah memikul tugas tersebut dan tidak pernah goyah dari perjuangannya. Perjuangan ini, seperti yang kita tahu adalah amat sukar dan berbahaya pada semasa ke semasa, bermula dengan penghinaan kelahiran anaknya oleh Maria dalam kandang, dan perjalanan yang berbahaya bagi melarikan diri ke Mesir. Beliau adalah seorang suami dan bapa yang bertanggungjawab, yang telah menjalankan tugas beliau terhadap keluarganya dengan penuh kesabaran, keberanian, kebijaksanaan dan kekuatan. Beliau merupakan model lelaki yang memainkan peranan dalam penjagaan Yesus dalam pembentukan kebijaksanaan dan budi pekertinya (Lukas 02:52), dan Beliau merupakan orang yang mana Yesus belajar perdagangan beliau. Joseph mungkin merupakan seorang yang pendiam, tetapi beliau telah memainkan peranan yang penting dan signifikan dalam rancangan Tuhan. Selepas lebih daripada dua ribu tahun, masih banyak yang perlu kita pelajari daripada contoh yang ditunjukkan oleh lelaki yang mempunyai perwatakan yang tenang dan kukuh ini. Beliau adalah seorang lelaki yang melakukan apa-apa yang dipercayainya adalah betul. Dalam dunia hari ini yang penuh dengan rasuah dan jenayah, kita perlu mengingatkan diri sendiri bahawa masih terdapat mereka yang berpegang kepada melakukan perkara yang betul secara senyap-senyap. Ramai orang pada hari ini tergolong dalam golongan generasi 'kepuasan segera' yang tidak menghargai nilai kerja dan menunggu apa yang mereka inginkan, malah telah meletakkan keperluan mereka atas keperluan orang lain. Kita perlu membenarkan nilai-nilai murni kembali ke dalam hidup kita supaya dapat hidup dengan lebih bermakna. Dalam usaha untuk kekal dalam perjuangan, beberapa ramai daripada kita dan pemimpin-pemimpin kita tetap setia kepada perjuangan yang telah ditetapkan, walaupun terpaksa bertahan dengan apa-apa cemuhan dan hinaan awam yang mungkin diperoleh? Pada zaman ini, bagi golongan yang besar, pengamalan prinsip-prinsip telah mengambil tempat duduk belakang dalam usaha untuk memperoleh kekayaan dan kemasyhuran. Sesetengah pemimpin politik melompat dari satu parti kepada yang lain lebih cepat daripada seekor katak dalam periuk mendidih untuk tujuan keuntungan peribadi dan banyak yang menggunakan amalan serong untuk memastikan kemenangan. Namun, syukurlah, masih terdapat ramai yang menggunakan prinsip dan keinginan melakukan perkara yang benar untuk menetapkan hala tuju dan menentukan tindakan mereka dalam kehidupan. Mereka ini terdiri daripada ahli-ahli parti-parti politik, aktivis sosial, masyarakat awam, NGO dan juga individu-individu yang terus bersuara tentang hak-hak mereka yang melarat, terpinggir dan teraniaya, walaupun ditakuti dan diancam akan diberkas. Mungkin terdapat halangan di hadapan kita, dan perjalanan mungkin kelihatan panjang dan menakutkan, tetapi kita mesti gigih dalam melakukan perkara yang betul, dengan keyakinan teguh dalam perjuangan kita. Saya mungkin akan lalai jika saya tidak mengiktiraf bahawa terdapat banyak orang, seperti Joseph, yang senyap tetapi merupakan sistem sokongan kuat, yang mana pejuang barisan hadapan tidak dapat berfungsi dengan berkesan tanpa sokongan mereka-mereka ini. Terdapat mereka yang hadir sebagai rakan-rakan, yang lain memberi nasihat dan idea serta sumbangan kewangan kepada projek kami, dan yang lain telah memberikan dorongan dan mendoakan kami. Ahli-ahli keluarga kita adalah tunggak kekuatan kita yang mampu berkongsi beban serta kegembiraan kita. Kami amat bersyukur dengan sokongan dan dorongan ini yang mengekalkan serta menaikkan semangat kami setiap hari. Rakan-rakan saya telah memberitahu saya bahawa pihak Katolik menganggap Yusuf sebagai wali penaung keadilan sosial. Amat sesuailah bagi kita yang terlibat dalam perjuangan keadilan sosial untuk mengambil inspirasi daripada insan ini yang memelihara iman dan telah menjalankan tugas dengan penuh kesabaran yang tidak terbatas. Marilah kita tetap berpegang teguh kepada kepercayaan kita dan kekal dalam perjuangan ini. Akhir sekali, saya ingin mengucapkan kepada rakan-rakan yang beragama Kristian, Selamat Hari Krismas, dan kepada semua, Selamat Tahun Baru. Prime Minister Datuk Seri Najib Razak's famous quote "endless possibilities" is going to haunt him. More likely for Malaysians in 2014, it will be the year of endless price increases! The prices of petrol and sugar have gone up, now electricity rates, toll rates, school bus fares and assessment rates in Kuala Lumpur are also going up. Recently, some Keadilan MPs met with a group of political aides from the US who were amazed to find that despite the harsh repressive laws, lack of press freedom, no access to national television and radio networks, the Pakatan have been to able to achieve so much. Last night, at a rally in Kuala Lumpur, we were told that a group of 21 employees from a bank have been sacked. Their so called "sin" was that they refused to be transferred. One of them has worked 11 years in the bank and stationed in Kota Baru. Earning a princely salary of RM1,800 a month, he has four kids. Because he was active in the National Union of Bank Employees (NUBE), the bank had wanted to transfer him to Puchong, Selangor. Obviously with his salary, he can't survive in Puchong, so he declined the transfer and the bank sacked him. What kind of justice is this? So far, the Human Resources Ministry has kept mum on this case. Recently the new weekly's licence was suspended by the Home Ministry. Najib and wife Datin Seri Rosmah Mansor. Recently, Rosmah went on a private trip to the Middle East and was allowed to use a government jet for the trip. What nonsense. Tun Dr Siti Hasmah Mohd Ali, the wife of former prime minister Tun Dr Mahathir Mohamad, never did this. Neither did the late Tun Endon Mahmood, wife of former prime minister Tun Abdullah Ahmad Badawi. Come on Najib. Face the truth. Because of all this, your popularity dropped by 10 points. The government has justified this by saying that the toll companies can do this every three years. How can this be? Look at the traffic volume for the North-South Expressway, New Klang Valley Expressway, the Damansara-Puchong Highway and the Federal highway, among others. Don't tell me they are not making excessive profits. My point is that the government must not allow increases in the toll rates even though legally the concessionaires can do so. If the Seremban to Port Dickson highway operator wants to increase the rate, that is fine because the traffic volume from Seremban to Port Dickson is not very heavy. The Federal government can learn a lot from the Selangor government led by Menteri Besar Tan Sri Khalid Ibrahim. The Selangor government, through Selangor Development Corporation (PKNS), among others, has stakes in Shah Alam Highway concessionaire Kesas Sdn Bhd and those of the Sprint Expressway and the Damansara-Puchong Highway and as such, was able to order its representatives to vote against the proposed increases. By so doing, this can help to reduce the burden faced by the people. 1. Wastage: Every year, the Auditor General highlights massive waste but has anything been done so far? What about the RM5 billion loss from investing in silicon wafer plants in Kulim and Kuching? 3. Transparency and accountability: For a start, table the accounts of Petronas to Parliament. I am a fourth term MP and we have never seen the real accounts of Petronas. If the Petroleum Development Act is outdated, we as lawmakers must amend it. 4.Government borrowings: Now it is almost at RM530 billion which is almost 53% of our national gross domestic product. Najib, please explain how in the few years that you have been the prime minister, you have doubled our national debt. How to compare with Taiwan which has not got a drop of crude oil and yet has zero national debt? – December 21, 2013. * Datuk Dr Tan Kee Kwong is MP for Wangsa Maju. KUCHING: The National Education Blueprint’s goal that all schools in the country meet the basic infrastructure requirements including access to clean treated water, at least 12 hours of electricity a day, along with sufficient toilets, classrooms, tables and chairs for the student and teacher population by 2015 starting with Sabah and Sarawak seems to be a pipe dream. Already at the end of 2013, it doesn’t help that the education minister admitted earlier this year that rural schools in Sabah and Sarawak lagged behind in facilities and needed massive support to catch up with urban schools. He had gone on record to say he agreed that education facilities in rural areas should be better and there should be no discrimination just because they were located in remote areas. The minister also announced that more powers had been given to the Education Departments of Sabah and Sarawak to speed up various projects such as the construction of new schools in both states. Observers pointed out that federal funding, however, was inadequate reflecting the neglect of the federal government towards the development of rural schools in Sarawak over the years. “The perception on the ground is that Sabah and Sarawak are deliberately being left behind and education being a critical component for the wellbeing of the state has been targeted as a tool of control,” said an observer. The problem was not restricted to existing schools that were in dilapidated conditions. It also extended to construction of new schools being built in the state. According to the third Auditor-General’s Report for the year, the National Audit Department for 2012 visited 16 rural schools under construction in Sarawak, and found that 15 were behind schedule. Only one was completed on time and deemed to have met minimum requirements. The AG’s Report noted its personnel only sampled a fraction of ongoing education projects in the state. It concluded that some 38 out of 56 projects worth a total of RM1.05bil were not completed within the stipulated time between 2008 and 2012. Under the first rolling plan (2011-2012), the state education department had made applications for 32 projects, estimated to cost RM1.15 billion. While under the second rolling plan (2012-2013) 104 applications for projects were submitted, with estimated costs of RM1.94 billion. Batu Lintang assemblyman See Chee How said: “It is a rude shock to me that, out of the 136 projects applied, only three projects were approved. Then, under the third rolling plan (2013-2014), out of the 94 projects costing RM1.5 billion applied for, only two projects had been approved. To exacerbate the problem, the majority of rural schools in Sarawak have been placed under the average or below average category making students vulnerable and unable to compete with their counterparts in West Malaysia when it comes to obtaining scholarships. Though education came under the purview of the federal government, considering the dangerous state of rural schools in Sarawak there is an urgent need to address the situation immediately. Sarawak PKR chief and Ba’ Kelalan assemblyman Baru Bian said: “Sarawak’s healthy financial status of RM22 billion in reserves should be channelled to elevate the deplorable conditions of schools in rural areas that are in dilapidated disrepair and without access to piped water or grid electricity. “Of particular concern to me is the Physical Infrastructure Audit Report 2011 of the schools in severely damaged condition that 57% of all secondary schools and 28% of all primary schools have ‘very badly worn down electrical wiring’.